I am excited, honored, and humbled for linenlaid&felt to be featured on the Etsy blog as part of a new series that shows artists in their inspiring workspaces. My bookbinding studio has been part of the Etsy marketplace for five years now (my Etsyversary was earlier this month) and to be selected from among some 1.2 million active shops just amazes me. The response from this feature has been incredible, and I've enjoyed reading all of the blog comments, receiving e-mails from college classmates and Cortona, Italy study abroad alumni, and shipping out orders to new customers. Plus, having my leather journals featured by Etsy on Instagram was an exciting and unexpected surprise as well. It was also fun to host visitors to my Nashville bookbinding studio. I got to talk deeply about my work with Etsy blog writer Julie Schneider, of Your Secret Admiral, and to watch Dylan Reyes photograph what he observed in my studio. I’ve been a devoted reader of the Etsy blog for years, and it has undoubtedly contributed to the evolution of my book business. I’d also had my eye on the inspiring workspaces blog features, which have also included food illustrator Lucile’s Kitchen, cut paper artist Swallowfield, and creature designer Hine. As for the feature itself, it shines a light on how I work in what is now my fourth home studio. That’s being a little generous — my “first” workspace was barely a studio. I had a corner carved out of an attic/bedroom and ended up doing most of my work at the kitchen table. I shared on my blog a few months ago just how far I’ve come. My studio is much improved, with better lighting and equipment, including my beloved flat file and heavy-duty paper cutter, plus standing West Elm work table and daylight lamp. Out the window, I watch my flower bed bloom (although not in January). I hope you’ll check out the Etsy blog feature and follow up with more writing by Julie and photography by Dylan, including on Instagram. For years, my husband and I have been passionate about using handmade books in our everyday lives and for special occasions. But we do meet people — often at art shows — who aren’t quite sure how they would fill a blank book. “I don’t journal,” is a common refrain. But that’s the thing. I don’t journal either, but I have many other ways in which I do use my books, along with those made by other great bookbinders. With this in mind, I’ve started a new project to document all the ways that handmade books can be put to use. This way of thinking has already changed how I talk about my work, how I arrange my booth at art shows, and how I encourage students in my classes. I’ve also dedicated a page on my new website to showcasing these inspiring books in action, along with using the hashtag #myusedbook. For starters, I’ve been looking closer at all the quirky and meaningful ways that my husband and I use books. When we bought our first home we started a guestbook that began to be filled at our housewarming party and which continues today to hold messages from overnight guests. We’ve printed Instagram photos and bound them in leather albums. And we stash little notebooks in our pockets while traveling. I keep a garden journal now. My husband fills in a “house book” with all of our home improvement projects and the ongoing story of our home. And I love the colorful sketchbook I made for myself. We’ve found that keeping these books encourages us to observe our lives a little more closely, and to preserve the things that matter. In turn, I hope this project inspires others to put their books into action and then share the results with others. To take part, you can either email your photos and a story to me at linenlaidfelt@gmail.com or post a photo of how you use your book on social media with the hashtag #myusedbook — and you can tag me in it with @linenlaidfelt so that I take note. I hope you will! The new year always reminds me of when I got my start on Etsy, but this Jan. 10 feels like more of a milestone than ever, as I’ve reached my five-year Etsyversary. I first signed up when we lived back in a small town along the Blue Ridge Parkway in Virginia. At the time, I was slowly building a plan to turn my bookbinding passion into my full-time profession. Five years later and transplanted to the great Nashville arts community, I’m binding handmade books every day from my home studio. It’s hard to say how far I’ve come in five years, but here’s another fun example. My first sale — a pair of small books — went to an acquaintance in Michigan. Flash forward to December 2014, and I found a book-lover interested in receiving four of my Instagram photo albums — all the way in Australia. It’s odd, but I must be big there, because it’s where I’ve made my most international sales, with 14. I’ve also sent eight to the United Kingdom, five to Canada, and four to France. I’ve also shipped books to Switzerland, Norway, Germany, Spain, and Ireland. Here in the U.S., I’ve reached 35 states. I do love sharing my work far and wide and that has been one of the best benefits of being involved with Etsy. Without it, I might not have gained the momentum to start my own business. Four minutes to explain bookbinding — that was my exciting challenge today during a live TV taping of "Talk of the Town" on Nashville's News Channel 5. You can see the full segment — my first experience like this — on the Talk of the Town website. I got this opportunity because of my upcoming book arts workshop at Watkins College, through their Community Education department. The show's host, Meryll Rose, invited me on to demonstrate one of three miniature book ornaments that I'll be teaching on Nov. 15 (details here). It's a class I love to teach, and this season I've created a more in-depth workshop that should be better than ever. Of course, for the show, I was doing a dramatically abbreviated explanation. I got ready in a way quite different from a normal class. Similar to a cooking show, I had to prepare my bookbinding "ingredients" to show each step. This means I had a lot of partially completed books on hand — some folded pages, other pieces of book board partially covered with decorative paper, and a few loose ribbons. I was calm before going on the air, but I'll admit the last minute before we went live passed quickly, as did the four minutes on air. After the whirlwind experience, I had to wait a few hours to see the clip online, catching up to what everyone else in the city had seen earlier in the day. It was cool to see my little handmade books featured under the bright lights, with multiple cameras zooming in and out. My morning at the TV studio gave me a neat behind-the-scenes view. And while I liked getting a taste of local showbiz, I'll probably stick with talking to students about bookbinding instead of into the camera. For the first time ever, I'm hosting a sale in my Etsy shop. In celebration of my birthday this month, I've put more than a dozen books on sale. Throughout August, you'll save up to $20 per book on my high-quality hardcover Coptic bound books and a few other styles. Take a look at the sale section, and pick out your new favorite journal. This sale will help me make room in my studio for some of the new designs I've been working on. You can see some of those books in my shop now, and I'll be adding more throughout the month (like new leather Instagram photo albums, hardcover books with my original screenprinted patterns, and softcover notebooks) so check back often. 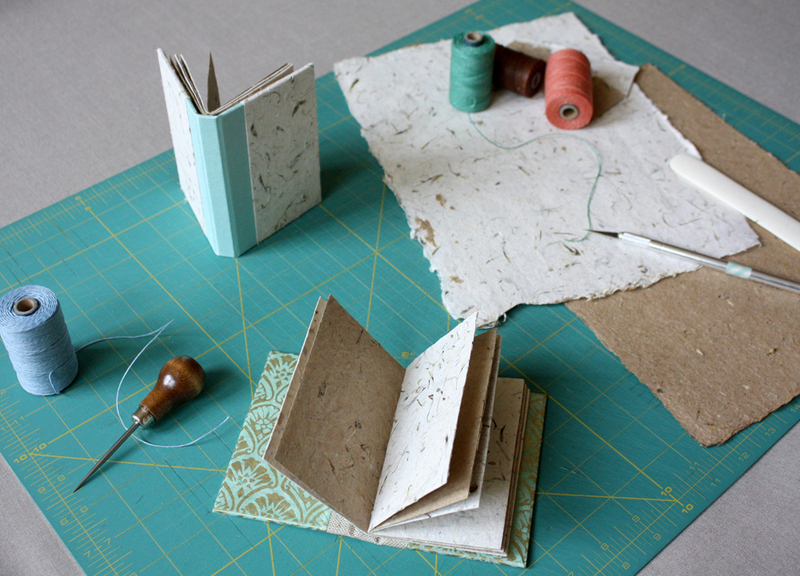 This Saturday I'll be teaching one of my most popular bookbinding classes at The Skillery. You'll learn how to bind your own large large leather journal from start to finish. And if that wasn't reason enough to get excited, this will be the first class I'll teach in The Skillery's brand new (and super awesome) space in the Germantown neighborhood of Nashville. There are still a few spots left in the class, so register now to reserve your space. This is not a class you'll want to miss! See below for the details. Learn to bind your own unique and functional book from a professional bookbinder. In this workshop, you'll learn to make a soft-cover leather book that can be used as a journal, a sketchbook, or a photo album. Using the Italian Longstitch style, a historical binding that dates to 14th Century Europe, each student will create a book with a leather cover that features exposed, decorative stitching on its spine and pages that lay completely flat when open. Students will use leather for the book cover and have the option to include interesting contemporary papers inside. The book will feature a wrap-around leather strap to keep the book closed. The class will also include an introduction to the world of handmade books. 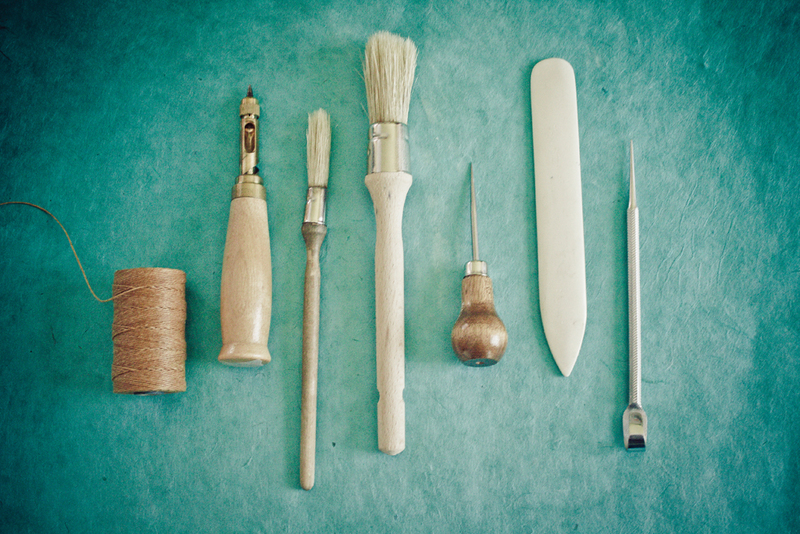 You'll learn the fundamentals of bookbinding, including proper techniques for folding, tearing, cutting, and stitching using traditional binding tools. And students will have the opportunity to view and handle a collection of professionally-made examples. All students will leave this class with a completed leather book, and the skills and resources to continue binding at home. No previous bookbinding experience is required. All tools and supplies will be provided. Porter Flea just keeps on getting bigger and better. The summer market included the art show's best ever Friday night preview market, with great art, music, and beer. Saturday began with a delightful breakfast for all the artists. And the big, blowout show on Saturday brought so many friendly shoppers and close friends. Here are a few of my favorite photos, pulled from Instagram and Twitter with the hashtag #pfsummer. I recommend you click to see them fullscreen! I'll be selling my handmade books today at the Thistle Stop Marketplace in Nashville. This handmade marketplace will be a fundraiser for Thistle Farms, a social enterprise that is run by women who have survived lives of prostitution, trafficking, or addiction. There will be about 20 other crafty vendors there (all of whom are either Thistle Farms volunteers or employees) selling their creations, and 50% of all sales will go towards supporting their papermaking, bookbinding, and sewing studios. This will be a great place to do some Mother's Day shopping, grab a tasty treat in the Thistle Stop Cafe, and support a wonderful organization all at the same time. Get a sneak peek at some of the handmade goods you'll find at the event here, and then come to Thistle Farms today between 10 a.m. and 4 p.m.